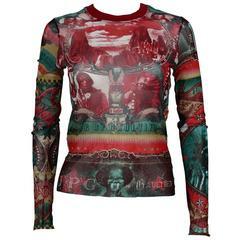 JEAN PAUL GAULTIER vintage Venus de Milo sheer mesh top featuring graffitis. Label reads JEAN PAUL GAULTIER Maille. Made in Italy. Size label reads : S. Please refer to measurements. Missing composition tag (probably 100% Nylon). Indicative measurements taken laid flat and unstretched (double bust) : shoulders approx. 29 cm (11.42 inches) / sleeves approx. 19 cm (7.48 inches) / bust approx. 37 cm (14.57 inches) / length approx. 58 cm (22.83 inches). CLOTHES CONDITION CHART - New or never worn : item is in perfect condition with no noticeable imperfections. - Excellent : item has been worn and may have not more than two minor imperfections (such as for example : faint stains or halos, pulled threads/seams, minor discolorations, etc...) - Good : item has been worn and may have more than two noticeable minor/moderate imperfections (stains, halos, marks, discolorations, micro holes/tears/snags, pulled threads/seams, etc...) - Fair : item has been worn and has noticeable major alterations (such as : stains, halos, holes, snags, tears, marks, discolorations, pulled threads/seams, etc...) Please note that most clothes may have been reviewed by a seamstress. NOTES - This is a preloved vintage item, therefore it might have imperfections. - Colors may differ slightly from actual product appearance due to differences in lighting conditions. - As a buyer, you are fully responsible for customs duties, other local taxes and any administrative procedures related to imports into the country of destination. Small break in the mesh on the back of the right sleeve (see last photo). Lightweight rayon with a fun feather print on top of Gaultier's traditional French sailor stripe.